Hartford has been experiencing multiple challenges related to stormwater management. With large quantities of impervious surface, high levels of clay, and a failing levee system that protects the Connecticut River from rising, the city’s ground cannot absorb stormwater, which exacerbates the amount of runoff and flooding. 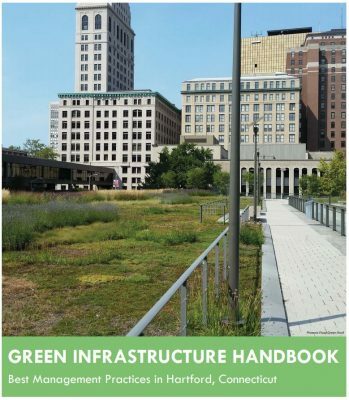 After receiving a grant through CIRCA’s Municipal Resilience Grant Program, Hartford hired a Green Infrastructure Specialist for 12 months to address stormwater issues and help implement their Climate Stewardship Initiative. With these products, Hartford city staff hope to inspire its residents to build a more sustainable and resilient future. This entry was posted in Funding Programs, Municipal, Planning Tools, Resources, Uncategorized and tagged climate change, flooding, planning, resilience.